The Tigerlight T100 is a personal self defense weapon that you can carry with you, or conceal in your car, truck, boat, or whever you need to access it. The T100, non-lethal self defense flashlight is endorsed by police authorities, military personnel, and self defense instructors alike. This protection device is equipped with a powerful light as well as a built-in type of pepper spray that ensures maximum effectiveness against attackers. Ergonomic Design - The device fits comfortably on the hands. Easy Usage - The unit is easy to manage and control. Safe - This portable weapon uses non-toxic materials. Stealth Technology - There's an element of surprise as the attacker is not aware that you are carrying a weapon. Stopping Power - The impact from the device provides a fast impact to the respiratory system, and can disarm any would-be attacker. Activating the pepper spray functionality of the device allows a stream of mist to be sprayed to the attacker. The vapor then penetrates and affects the respiratory system through the nose and mouth as well as the skin. The weapon delivers such a powerful impact that aggressors and attackers can be incapacitated and disoriented for some time. The high intensity light and mist from the system can also temporarily blind the attacker and give you ample time to defend yourself. Designed to look like a harmless handheld device (flashlight), no one will know that you have an effective weapon of defense with you. This will keep you safe and secure wherever you go. Lightweight - the device is small and lightweight, and this can be carried inside the pocket or purse so that you can securely walk or jog around the neighborhood safely. Well-constructed - the light on the flashlight delivers a bright beam, and the construction itself is solid. Discreet design - you can surprise any attacker with the weapon's concealed and discreet design. Sensitive - According to some customers, the light on this device easily turns on even at the slightest touch. The Tigerlight T100 non-lethal defense system flashlight is well-loved by customers who have already purchased the product. It has an average rating of 4.5 stars out of 5 at the Amazon.com site with a majority of the consumers giving it 4 and 5-star rating. The only negative issue about this unit's performance is its oversensitivity to the touch. When placed inside the purse, the light sometimes turns on when touched accidentally, and this can lead to the early drainage of the batteries. We are recommending this protective device to anyone who wants to have peace of mind against attackers both indoors and outdoors. The mist from the pepper spray can surprise, disarm, and disorient an attacker so that you can protect yourself and your loved ones. Indeed, the Tigerlight T100 non-lethal defense system flashlight is a worthy investment as it can provide you with a sense of security all the time. 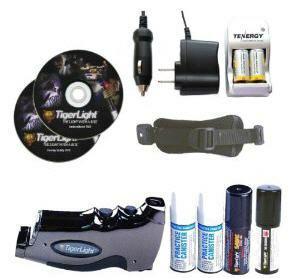 How Much Should You Expect to Pay for the Tigerlight T100 Non-Lethal Defense System Flashlight. You can purchase this model of non-lethal weapon for about $125 at the Amazon.com site. The main reason is it is designed to keep yourself or someone you care about from getting maimed, killed, or severely injured by an attacker. 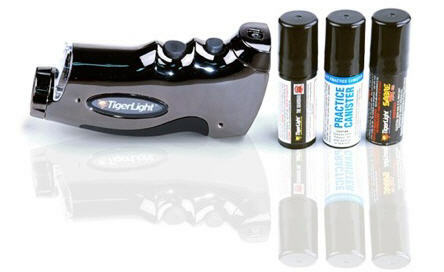 A TigerLight is proven to be significantly more effective compared to regular pepper spray. The percentage of it actually stopping an attacker is 96%, according to the manufacturer. Individual results will vary. But there is a case study that you can read by the LA county Sherifs department that provides a more detailed analysis of this 'Stop Rate', from which the 96% Stop Rate was achieved. You can read the report here. It is simple to use and carry on your person as you conduct your daily routines wether you are joggin, walking, or getting to your vehicle. It's nondescript so people will not notice you have a self defense weapon on you, and frankly it's a nice looking piece of equipment. Although it's more expensive than other sprays or flashlights, it does live up to it's value.